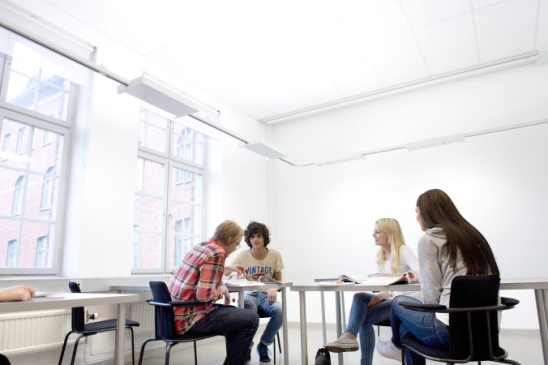 We can improve students wellbeing, concentration and productivity with good lighting in our schools, colleges and universities. A well lit classroom will not only create a bright and positive ambience, it will facilitate learning and enhance teaching. Long gone are the days where students faced the same direction all day with desks in rows; the classrooms are now typically arranged with individual tables and grouped tables. Lighting of the students’ faces is also one aspect of lighting that is crucially important and there is lighting software available that can calculate this. A good lighting solution implemented on the classroom walls will ensure well lit white boards and flip charts etc, and to illuminate the “Smartboard” a diming lighting solution should be in place so the light projected onto them can be controlled. It is also worth noting that lighting can account for 30% of a school’s electrical outlay and so an efficient, up to date solution will benefit the overall running costs. Lowe Electrical have been working in the education sector for over 25 years. We are experienced in advising, planning and installing electrical solutions for schools, colleges and universities across Leicestershire and the East Midlands.